Days after three female Kurdish activists from the terrorist-linked Kurdistan Workers' Party (PKK) were murdered in France, Turkish Prime Minster Recep Tayyip Erdogan has made a couple frank comments. Some have accused the Turkish government of carrying out the attacks, but Erdogan claimed the murders were a sign of internal discord between Kurdish separatists. He said earlier that the incident could be a "provocation" from sections of the PKK opposed to talks between the state and the group's imprisoned leader, Abdullah Ocalan, aimed at persuading the PKK to disarm. And he went on to ask why French President Francois Hollande had met with Sakine Canisz, one of the murdered activists and co-founder of the PKK. "How can he [Hollande] regularly meet with these people who are members of a group listed as a terrorist organisation by the European Union and who are wanted under red bulletin (issued by Interpol)?" Erdogan asked. "What sort of a policy is it?" The Turkish leader repeatedly accused some European member states, including France and Germany, of obstructing Ankara's fight against the separatist PKK, saying that they were letting PKK members freely circulate on their soil. Valley of the Wolves, a Turkish television serial aired by a television channel controlled by Prime Minister Recep Tayyip Erdogan, has been turned from anti-Israeli and anti-American into anti-Iranian, the Iranian website said. “In one scene in the film, Iran is presented as a country which carries out spying missions in Turkey. Turkish special service officers storm the Iranian consulate building at midnight,” the Iranian website reported. This may or may not have anything to do with Iranian President Ahmadinejad bailing on a December visit to Turkey. In other words, it would be wrong to believe that bigoted Sunnis in Ankara embarked on an anti-Shiite mission in the Middle East that has left Turkey at odds with central governments in Syria, Iraq, and ultimately in Iran. To the contrary, Ankara has gone to great lengths to avoid the region's sectarianism, but its efforts have not been very fruitful. Despite critiquing his neighbors amidst overlapping geopolitical tensions, Erdogan has still found time to make new friends abroad. Like Senegal. Erdogan called for a "new momentum" in the Turkish-Senegalese relations by laying the legal groundwork for investors and encourage businesspeople. "We consider Dakar as an important gateway to Africa. There is a lot to do in terms of bilateral trade as well as cooperation in third countries," Erdogan said. Erdogan said Turkey and Senegal could also cooperate in construction and defense sectors, adding that the two countries should establish in the shortest possible time a business council. Erdogan also made stops last week in Gabon and Niger. But why visit West Africa when the Syrian conflict and Kurdish independence activity are happening in Turkey's backyard? Because every other would-be world power has a piece of developing African economies, too. Let me be blunt: Africa is a huge continent, where all major powers are in stiff competition. Three regional powers — Turkey, Israel and Iran — are participting in this competition. While revolutions, changes and clashes are unsettling the Arab world, the rising world powers are enthusiastic about Africa, and China is at the top of this list. As you can see, seemingly disconnected actions have a unified purpose: supress the legitimacy of the PKK, counterbalance Iran, and maintain regional power, while building an international presence. 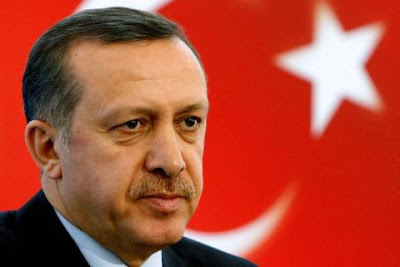 Perhaps with the right moves, Erdogan can actually build his neo-Ottoman Empire.